How long have you been playing? : I have been playing over 10 years now? Maybe… it was the tail end of the Night's Children plot arc. Describe your character: So, Marcus is a paladin with the stick shoved not as far up his backside as you would normally expect. He is originally from Civen, but when he joined his order, he gave up any and all ties with his birth nation. He is a master paladin in his order and the commanding officer of the Templar Legion. What was your favorite in game moment? : Oh god. There are so many to list. If I had to narrow it down, I would have to say it would be the ritual to destroy the Al'Carn's phylactery on fourth shift. I was one of the people to actually do the ritual and dumb me I didn't think we would then immediately march on Cairnhold. So, I spellstored every bit of power I had so those who were going to be defending us as we did the ritual would have a lot of healing available. 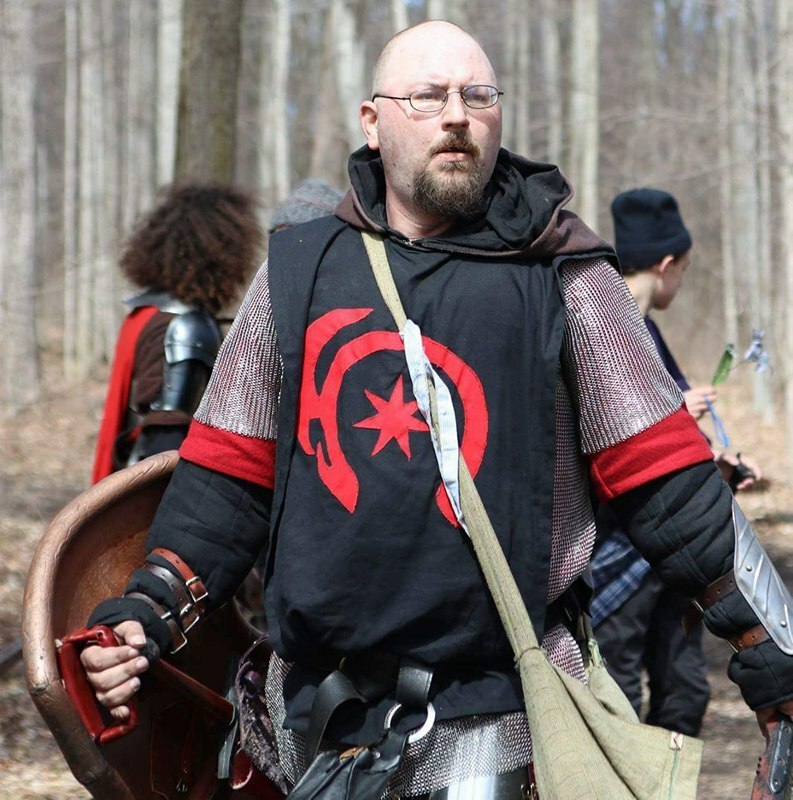 So when we marched, it was the first time since I played a level 1 character where I went into a fight with only what protections I had up. Let me tell ya, it was exhilarating and terrifying at the same time. Why do you love Kingdoms of Novitas? : The family we have at game. Though I only see everyone once a month, it's like returning home. Who is your favorite PC? : Wow so many to choose. I would have to say Phil Braun's old PC Gaius. What did you think your character concept was? What is it now? : So when I brought Marcus in I wanted to make someone who could be approachable to new players. I wanted to take the idea of bringing new low level characters out with veteran groups to a new level. So I made Marcus to be the solid rock that new players could fall back to when they bit off more then they could handle. I feel that I have accomplished that with the Legion. As to what it is now, it really hasn't changed much except that now I am stepping back and giving the newer players in the legion a chance to step up and shine. As to if they shine bright or not is in their hands, but I will be there to back them up when they do or say something that would end up with them in hot water. How many PCs have you had? What happened to them? : I am on my third now. My first was a wood elf druid who hated and despised humans because all they cared about was themselves. This ultimately lead to him having a chaotic rampage where he killed a group of elemental worshippers and the trees were really angry and came in and beat him to death. It made for some serious role-play with both druid and non druid players and, when he was buried I know there were a few wet eyes. My second PC was a Dellin who secretly was a darkness worshiper. He died due to pride and challenged the wrong person to the ultimate fight and lost. Marcus is my third PC.